Eamon O Cuiv has resigned as Fianna Fail's deputy leader and communications spokesperson. In a statement, party leader Micheal Martin said he had accepted Mr O Cuiv's resignation from the positions. Mr O Cuiv will remain a member of Fianna Fáil, and of the parliamentary party. Mr Martin said: "Eamon's refusal to support the parliamentary party's position on the Fiscal Compact meant that it was no longer feasible for him to occupy these roles." 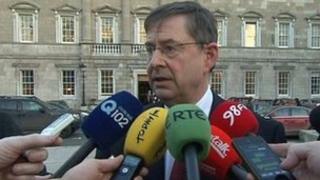 Speaking on the steps of Leinster House, Mr O Cuiv revealed that he had been forced out. "The leader asked me to resign because we had a fundamental policy difference between us," he said. "He also told me I was to vacate my position on the front bench and I accept that." Mr O Cuiv said Fianna Fail had decided on a future direction and "what it stands for" but that he felt very strongly about the EU treaty. "There's no way we can accept certain proposals unless certain fundamental issues are dealt with first, which include the issue of bank debt that we're being saddled with and which arose in the first place from reckless lending," he said. "Until that issue is resolved I don't believe we should agree to any fiscal treaty or any (European Stability Mechanism) treaty. Speaking on RTE's Drivetime, however, Mr Martin indicated that Mr O Cuiv is facing expulsion from the parliamentary party if he does not vote with the party on the Fiscal Compact in the Dail. He said if a member does not support the party, that the member could lose the whip. He said Mr O Cuiv had indicated to him that he would not be supporting the party. On Tuesday, the Irish government confirmed that a referendum will be held on the EU Fiscal Stability Pact, following advice from the attorney general.